Honestly, I think many of their prices are well beyond affordable, but it’s nice to browse nonetheless. 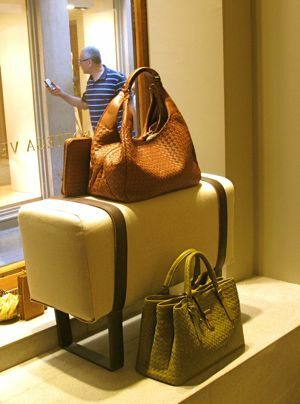 While those who know the brand would be able to point out a Bottega Veneta bag or briefcase on the street, others would be clueless… and that is definitely part of the appeal. 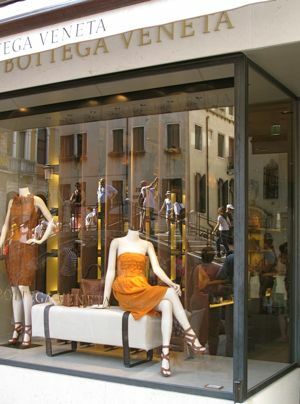 This shot of another branch of BV elsewhere in Venice; look closely at the reflection of the people crossing a pedestrian bridge in the shop window… I thought that was cool. Thanks for posting one of my absolute favorite labels–how fun! I was introduced to the brand by a CNN style show hosted by Elsa Klensch which I watched in the 80s and 90s. It seems that there has been a resurgence in BV’s popularity in the last few years–nice to see-but like you, I appreciate most of all the discreet luxury one can enjoy owning a BV item. It’s been fun seeing all your Venice-related posts. 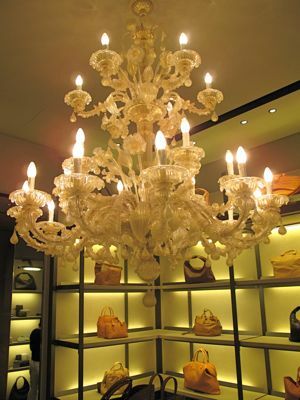 My husband and I stayed just a few doors from the BV shop so it was a treat to be so near the boutique. I’m a huge fan. Thanks! Hubby gave me a BV wallet about four years ago, I did not know how much it was until I looked one day. Gave me an apoplexy! As much as I appreciate his generosity, I told him NEVER gift me anything worth so exorbitant as I’d rather put the money aside for mortgage payment. I do admit my BV is still ‘buong-buo’ even with all the wear-and-tear it gets. 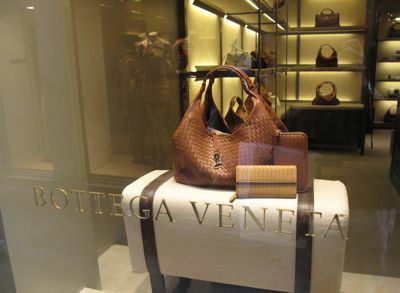 Gosh I would love a BV Intrecciato bag but the price is just exorbitant. I’d rather put the money in a time deposit account for the future. It truly is the most luxurious brand around. Just when one thinks the French taught us everything about douceur de vivre, the Italians sneak up on you with their fantastic leather, luxurious cashmeres, fast cars and ultimate pianos. Hard to keep up. Logos nowadays is one more cross that conscientious consumers have to bear. I use to take off tailorâ€™s labels from my trousers back pockets and the alligator patches from my polo shirts but RL embroidered the damned pony on it so I gave up. They doubled down on their original sin recently by enlarging it so it is now easier to set apart tolerable vulgar from egregious vulgar. I also don’t like screaming brand logos. My sister gave me a Gucci bag with the big intertwined gold Gs. 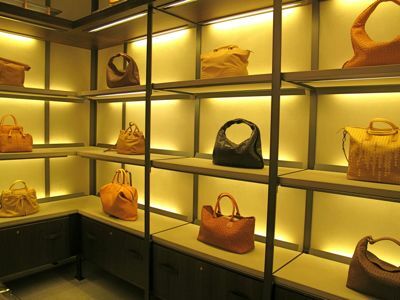 But geezzz, even if don’t let the logo show, some friends really examined the bag to check if it was genuine. I was so embarassed. I mean, it’s just a bag, but I do love quality. That is why whenever I want to use a really expensive bag without the screaming logo, I use a very old Ferragamo and nobody gave a damn. That’s bag utopia for me because I am the type who just put the thing down on the floor (or under any table) whenever I am at gatherings…I hate it when people put their expensive belongings on top of any table! I chanced upon someone like that and my forked tongue came out, hahaha! I asked the person to move her “comadrona bag” some place else so that people can put their coffee cups on the table. Moreover, I’d rather see one who is proud of his fish pan than his bag, LOL!!! no, i can’t afford any of them, but i don’t like those signature things where the logos seem to be shouting and jumping at you. class and elegance are still best expressed with a whisper. i agree with you MM, fake is fake. i would rather buy a nice brand less stuff than buying a fake one…. @millet: so true, class and elegance are still best expressed with a whisper. 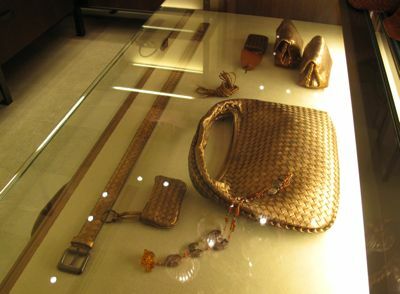 I have no idea what the bags cost these days but in 1983 my wife was given a BV red woven bag, which then cost me $700 US. It is still supple, looks unblemished, and is still used looking really nice, so over time it has been a sound economic purchase, whereas bags costing about $200 have lasted only a few years. cant stand big logos that is why I dont owe coach bag ;-) but I have a cool furla which I have for 6 years now but all worth it. This is my dream bag, the leather is oh so soft and i love the smell of their leather! For now, this is still a dream – I think I’d be dreaming for a long long long while..
Till then – all I can do is ‘window’ shop for them.